Or gingerbread waffles for an autumn breakfast – either way they are an out of the ordinary treat. I have always loved gingerbread. Maybe it started with the million times I made my parents read the Gingerbread Man to me… maybe it was the Hansel and Gretel story… Maybe it was the gorgeous Christmas windows in John Wanamaker’s in downtown Philadelphia that depicted Victorian ladies rolling out gingerbread for excited children. And they really moved. O.k… here it is. I am a sucker for Christmas windows – especially animated Christmas windows. At least once during Christmas vacation I was invited to take the train to work with my dad. That meant an hour sitting on a chair while my mom created ringlets, followed by rigorous inspection of my cleanliness, a frilly dress, coordinating stockings, coat (red!) , hat, scarf, mittens, shiny black patent Mary Janes (the shoes not the drug), and a pair of red boots pulled over my shoes. Once out the door Dad and I headed for the train station and waited for the train. I loved riding that thing. I don’t know what it was like now but as a little girl I can remember velvet seats, and a chubby conductor who wore a blue uniform and white gloves, had big brass buttons down his front and called me “Little Miss” and my dad “Mr. Morris”. It didn’t take very long to get to the city where Dad’s office building was. The streets and sidewalks were busy and there were huge banks of gray snow along each side. The pretzel vendors weren’t out that early which always disappointed me. We’d stroll through the snow , each step crunching, and each breath billowing dragon smoke. Sometimes we chatted about everything and sometimes we just walked in silence as everyone else rushed past. When Dad and I were together time slowed to our pace – we owned it. If you are young you might not remember these but my dad’s building had one of those revolving doors that went round and round. I was terrified of those doors – I always felt like I was going to be caught in them. My dad always lifted me up so he could carry me through. The minute you stepped in to the pie shaped compartment of the door you could feel the warmth radiating out of the building. The lobby was huge and we always grabbed a cheese Danish to share for breakfast and coffee for dad, hot chocolate for me. Then a quick chat with the doorman, a few steps across the shiny marble and up the elevator to his floor. I’d draw quietly while he handled his morning stuff and then we’d head out for lunch. It was the purply, pinky evening that I waited for. Once the sun went down we walked down the streets, looking in the bright Christmas windows of the stores, eating hot pretzels and mustard, and always ended up at Wanamakers. I think it was that store that had an entire floor of animated Christmas displays and you walked around and looked at everything. There was a bakery that we’d stop at on the way back to the train station. I almost wanted to stand outside because every time a customer came out a burst of warm, gingerbread scented air came out with them. There was something about standing in the cold, dark evening and being bathed with bursts of scent and heat at unpredictable intervals. Warm gingerbread in hand we headed for the train and ate it to the last crumb before we ever got home. O.k. enough rambling… waffles. Mix the spices into the dry ingredients. I added ancho and a pinch of cayenne to this because I like spicy gingerbread. You can leave that out if you prefer. The batter for these gingerbread waffles is thick. If you want to lighten it up you can separate the eggs and beat the whites until stiff and then fold them in last. I like maple syrup on them but lemon curd, cream cheese, or fried apples are all good, too. In fact they make a great dessert waffle with vanilla ice cream. I can’t take you back to experience that moment but I can share the flavor in a unique way with these gingerbread waffles. Give them a try. Perfect for the first chilly day in the fall, these spicy waffles are filling and delicious. Serve them with melted butter, hot maple syrup, sliced apples, and bacon for a breakfast everyone will love. 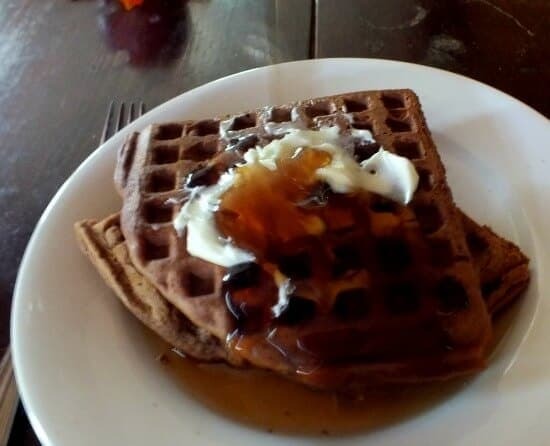 Ladle onto your waffle iron and bake until they stop steaming. Remove and serve immediately or keep warm in a low oven. so when are you inviting me over for brunch?!?!? ha! Heavenly! Perfect for a holiday breakfast! Marye, thanks so much for rambling on as it was delightful to hear about your outing with your dad and those Christmas windows! I’ve been to NYC and seen the decorated windows at Macy’s and I could stare for hours! 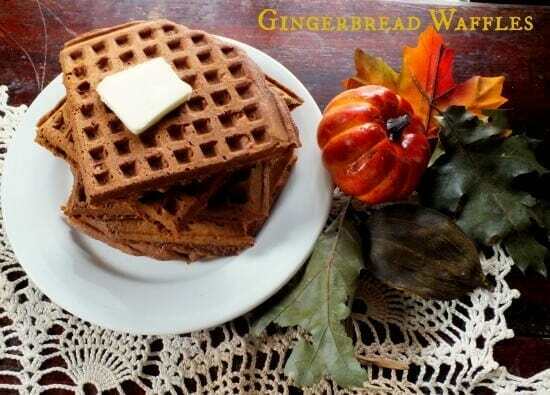 BTW, these gingerbread waffles sound wonderful – gosh they must have smelled awesome! Aww thanks Shashi! I appreciate anyone who thinks my ramblings are delightful! LOL! Thank you so much. I bet your kitchen smelled like Christmas while these were cooking. What a fun holiday breakfast! Ha! It does all the time because Yankee Candles! But yeah… these are great for holiday breakfasts! They really are, Catherine! Thank you so much! Sounds like you have some special memories! It’s fun to think back and remember things that made you so happy when you were young. 🙂 And these gingerbread waffles…yum! They sound absolutely divine, Marye! I have a life time of memories…LOL! It is fun… and these waffles are amazing! Thanks! These look fantastic and I have SO been craving waffles lately. I will have to add these to my fall brunch menu! That sounds like fun, Elena! It really is! I hope they like it. Gingerbread waffles sound amazing – definitely keeping this recipe handy for the upcoming holidays! Gingerbread waffles sound like heaven. I love fresh waffles, never ever frozen, but I don’t make them very often because my kids make a ginormous mess eating them. 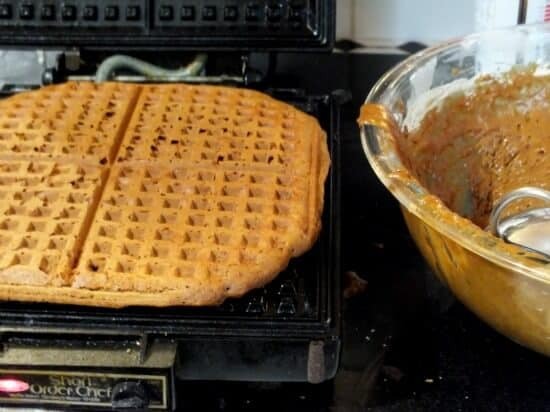 Gingerbread waffles sound like they are probably worth the clean up though! Love these waffles Marye. A little spice for fall. PERFECT back to school breakfast! These look perfect for a fall OR winter weekend breakfast! I can’t wait to try them out. Thanks for sharing! What a fun memory. I love the Christmas windows, too. I would always go into NY city to see them with my grandmother. My daughter is a huge fan of gingerbread. She would adore your waffles. You list the ginger twice. Is it 1 or 2 teaspoons? 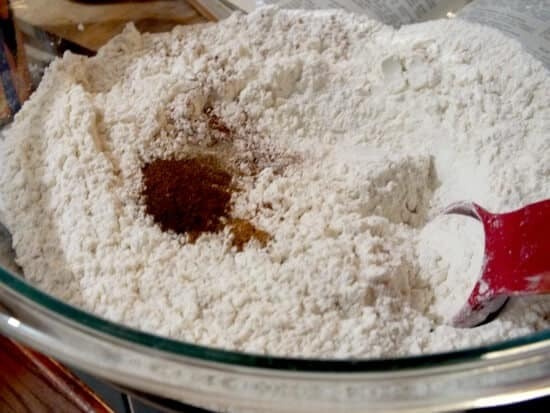 If you add salt to the recipe anyway, is it important to use unsalted butter or can you just reduce the amount of added salt? Just one. You should use unsalted butter because you have no clue how much salt is in the salted – you can’t control it.